Long-term study involving more than 800 World Trade Center Responders shows that post-traumatic stress disorder has strong links with cognitive decline. 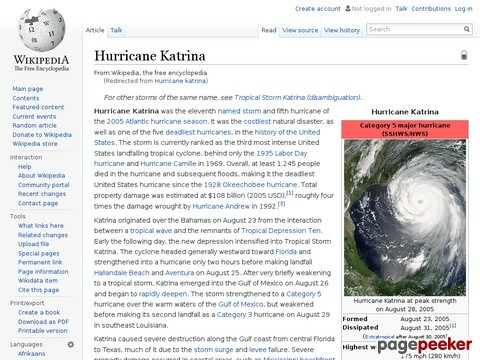 Hurricane Katrina was the eleventh named tropical storm, fifth hurricane, third major hurricane, and first Category 5 hurricane of the 2005 Atlantic hurricane season. It was the third most powerful storm of the season, and the sixth-strongest Atlantic hurricane ever recorded. Katrina formed over the Bahamas on August 23, 2005, and crossed southern Florida at Category 1 intensity before strengthening rapidly in the Gulf of Mexico, becoming the strongest hurricane in the Central Gulf since Hurricane Camille. The storm weakened considerably before making its second landfall as an extremely large Category 3 storm on the morning of August 29 along the Central Gulf Coast near Buras-Triumph, Louisiana. The storm surge from Katrina caused catastrophic damage along the coastlines of Louisiana, Mississippi, and Alabama. Levees separating Lake Pontchartrain from New Orleans were breached by the surge, ultimately flooding about 80% of the city.